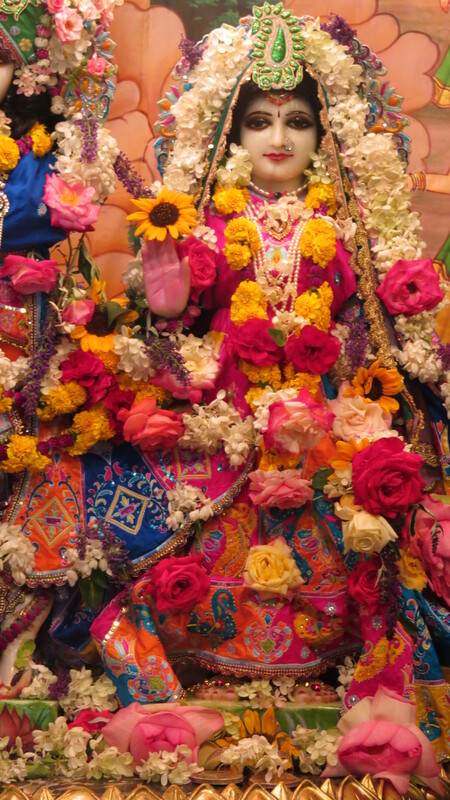 Today we honor the appearance of Srimati Radharani, Radhastami, with a half day fast, and a celebration at noon (when She appears). Kṛṣṇa is svayam. Kṛṣṇaḥ svayaṁ samabhavat paramaḥ pumān yo. Kṛṣṇa is paramaḥ pumān. Paramaḥ pumān means the ultimate Supreme Personality of Godhead. But He is always manifest in different incarnations, and of all the incarnation, Lord Rāma is the foremost, Balarāma. You have heard the name of Balarāma, Baladeva. Similarly Rāma, Rāma means the Supreme Enjoyer. Ramante yoginām anante sac-cid-ānanda-cirātmanīti rāma-padenāsau. Rāma means real bliss, and all the yogis, either dhyāna-yogī or a jñāna-yogī or a bhakta-yogī… There are three kinds of yogis. Everyone tries to enjoy that eternal bliss, and that is real pleasure. Therefore Rāma. So this verse… Our, this respectable Indian lady, she will begin Rāmāyana… This Tulasī, actually it is not Rāmāyaṇa. It is called Rāma-carita-manasa. Rāmāyaṇa means Vālmīki Rāmāyaṇa, but people have taken it as Rāmāyaṇa. Actually, Tulasī dāsa has expressed his own feelings about his devotion to Lord Rāma, and therefore he has named it Rāma-carita-manasa, his mind full with service attitude for Lord Rāma. That is the real meaning of this book. But people have misinterpreted; they are going on just it is Rāmāyaṇa. And Rāmāyaṇa, of course, anywhere where Rāma’s activities are described, that is called Rāmāyaṇa. That is another sense. But real Rāmāyaṇa means the Rāmāyaṇa composed by Vālmīki Rāmāyaṇa. Rāmāyaṇa composed by Maharṣi Vālmīki. And this is… It is a popular notion that this is Rāmāyaṇa, but actually this book is called Rāma-carita-manasa. So some of the description of Rāma are there, but not all the description. Rather there are many differences from the original Vālmīki Rāmāyaṇa. Anyway this is song of a devotee for his Lord Rāma. In that sense, you can call it Rāmāyaṇa, but this book is actually Rāma-carita-manasa. So in the fifth chapter, Sundara-Khanda, it is a very nice verse. What is that? Śāntaṁ śāśvatam aprameyam anaghaṁ nirvāṇa-śānti-pradam. Each word is meaningful. Śāntam. The Lord is never disturbed. Why He shall be disturbed? Just like we are, in this material world, we are always disturbed in so many ways. The duration life is short, and we are always embarrassed with so many problems, political, social, religious, cultural, so many things. And family, maintenance of family is more difficult than maintaining an empire. So this material world is full of anxiety. I have several times explained, asad-grahāt. Because we have accepted something which is not eternal. Anything which is not eternal will always create disturbance. But because the Lord is eternal, therefore He is śāntam. Whenever we’ll find the face of Lord Kṛṣṇa or Rāma, Viṣṇu, you’ll find smiling with peace. As soon as you’ll see you become also peaceful. His very face is so nice. Śāntam. And śāśvatam. Śāṣvatam means original. It’s not that Rāma and Kṛṣṇa, as the Māyāvādī philosophers say, that the impersonal Brahman appears in form. This is rascaldom. Actually, He appears in His own form, as it is stated in the Bhagavad-gītā, sambhavāmy ātma-māyayā [Bg. 4.6]. We are accepting this form not by our own potency. I have accepted this body, you have accepted this body, not by your own will. You have been forced to accept a particular type of body according to your work. You cannot make choice. Otherwise, everyone would have made his choice to take birth in America or some place like that, or heavenly planets. Oh, that is not choice. Just like if the foreigners, they apply for immigration, there is, the choice depends on the highest authority. So similarly, this body is not śāśvatam. It is not my original body. This body is changing. I may have this body this time, I may have another body, another species of life; therefore it is not śāśvatam. But the Lord’s body is śāśvatam. As it is confirmed in the Bhagavad-gītā, śāśvataṁ puruṣam, and He is enjoyer. So the same word is used here. Śāntaṁ śāśvatam aprameyam. Aprameyam means that cannot be measured. The Māyāvādīs, they cannot conceive how immeasurable, unlimited. Therefore as soon as they take it that God is unlimited, immeasurable, they take it for impersonal. They cannot conceive that God can assume any extensive form without any difficulty. Just like He appeared as Hiraṇya…, I mean to say, Varāhadeva. The Varāhadeva, He appeared in such a gigantic body that He could lift this whole planet by His tusk. So just imagine how much great body He assumed. So aprameyam. Another, He can assume so small body. Just like Parīkṣit Mahārāja, when he was within the womb of his mother, attacked by the atomic energy, so Kṛṣṇa entered the womb of his mother and saved him. Just imagine how small He became. The example is that the sun. Sun is so powerful that he is soaking water from everywhere. He is soaking water even from the filthy place where people are passing urine and stool. But sunshine is so powerful that it is soaking water from the urine, urinals, and lavatory, latrine, but still sun is pure. And by the sun’s contact that place also becomes pure. This is called purity. Even impure, even I am impure, if am in touch with Kṛṣṇa consciousness then I also become pure. He does not become impure. We are so, I mean to say, teeny, that if I go to a contaminated place, I become contagious. I become infected with the contamination. But Kṛṣṇa or Rāma, They are so powerful that even a contaminated person approaches Him, He, it does not mean that Kṛṣṇa becomes contaminated—the contaminated person becomes purified. This is very nice to understand. So anyone, with any aim, if he approaches Kṛṣṇa or Rāma, he becomes anagham. Nirvāṇa. Nirvāṇa-śānti-pradam. This nirvāṇa means finishing. Śānti. This material life, material existence, is always full of threefold miseries. Rāmākhyam. Rāma means the ramanīyā, the beautiful, or the enjoyer, rāmākhyam. And jagad-īśvaram. And He is the master or the proprietor of the whole universes. Sura-gurum. Sura means the demigods and gurum is spiritual master. Sura-gurum. Just like Arjuna is sura, and his guru is Kṛṣṇa. Vyāsadeva, his guru, Nārada; Nārada’s guru is Brahmā; Brahmā’s guru is Kṛṣṇa. So sura-gurum. māyā-manusyam. And when He appears as human being, that is māyā. māyā means actually He is not an ordinary man. He is the Supreme Personality of God, but the rascals they think that “Because Rāma and Kṛṣṇa has appeared like one of us, He is a man, He’s an ordinary man.” This is the version of the rascals. That Rāma, especially there is a class who are known as Ārya-samājīs. They do not agree that the Supreme Person can, Supreme God can appear as Rāma and Kṛṣṇa. They do not know that although He appeared as one of us in the form of human body, He is not a human being. He is the Supreme Personality of Godhead. Therefore it is called rāmākhya, māyā mānuṣya hari. He is the Hari… Hari means the Supreme Personality of Godhead who can give you all pleasure, taking all your miserable condition. He is Hari. So vande ‘haṁ karuṇākaraṁ raghu-varaṁ bhu-pāla-cuḍāmaṇi. So he is offering his respectful obeisances to the Lord Rāma. Karuṇākaram. He comes, paritrāṇāya sādhūnāṁ vināśāya ca duṣkṛtam [Bg. 4.8]. Therefore He is karuṇā-ākaram. Ākaram means mine. He is the great mine of mercy. Karuṇākaraṁ raghu-varam. And because He appeared in the dynasty of Mahārāja Raghu, so He is the Supreme Personality in the Raghu dynasty, raghu-varam. And bhu-pāla-cuḍāmaṇi. He is the helmet of all kings. Cuḍāmaṇi. Cuḍāmaṇi means, maṇi means pearl, and cuda means helmet. So the pearl is placed in the crown. So He is the, although He appeared as King, but He is the helmet of all kings. In this way, Lord Rāma’s description is here. Now Mātājī requested me to explain one verse, so I have tried to explain. Now today is our Rādhāṣṭami ceremony. I must speak now something about Rādhārāṇī, and then I shall go up, reach my apartment at twelve. In the meantime, you can observe the ceremonies. So, so far Rādhārāṇī, Rādhārāṇī, today is the birthday of Śrīmatī Rādhārāṇī. Rādhārāṇī is the pleasure potency of Kṛṣṇa. Kṛṣṇa is the Supreme Brahman. Just try to understand. Kṛṣṇa is the Supreme Brahman. 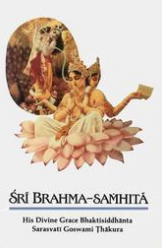 Paraṁ brahma paraṁ dhāma pavitraṁ paramaṁ bhavān [Bg. 10.12]. So when paraṁ brahma wants to enjoy… That enjoying spirit is there in the paraṁ brahma. Otherwise we cannot have this enjoying spirit. Because we are part and parcel, therefore we have got that enjoying spirit; but that is materially contaminated. But the fact is there, because Kṛṣṇa, He is enjoying, this enjoying spirit we have got also, but I do not know how to enjoy. We are trying to enjoy in the matter, in the dull matter. That is spiritual. So brahman, brahman sukhānubhūtyā. People are trying to feel what is brahma-sukha, pleasure of brahmānubhāva. That is not material pleasure. So many yogis, they have given up their family life, their kingdom, and meditating to achieve that Brahman pleasure. Actually, the idea is Brahman pleasure. So many brahmacārīs, so many sannyāsīs, they are trying to achieve that Brahman pleasure, and in order to achieve that Brahman pleasure they are neglecting, they are kicking off all this material pleasure. Do you think that Brahman pleasure is ordinary, this material pleasure? To achieve a portion of Brahman pleasure, if they are kicking off all this material pleasure… Don’t talk of ourselves. We are ordinary men. In the history we have got instances, that of Bharata Mahārāja. Bharata Mahārāja, under whose name this planet is called Bhāratavarṣa. That Bharata Mahārāja was the emperor of the whole world. And as emperor he had his beautiful wife, young children. But at the age of twenty-four years, just young man, he gave up everything. All right. This is very old story, of course, but you know Lord Buddha. He was also a prince. He was also prince, not ordinary man, and he was kṣatriya, and he was always enjoying with beautiful women. That is the palace pleasure accustomed in every, in Oriental countries, that in the palace there are many beautiful girls, they’re always dancing and giving pleasure to the kings and the prince. So Lord Buddha was also in such pleasure, but he gave up everything and began to meditate. There are many hundreds of instances in Indian history that to realize the Brahman pleasure they gave up everything. They gave up everything. That is the way. Tapasya means voluntarily accepting something severe for realizing the supreme pleasure. That is called tapasya. So if, for tasting a little Brahman pleasure, all materialistic pleasures are to be given up, do you think that the Supreme Brahman, Lord Kṛṣṇa, is enjoying this material pleasure? Is it very reasonable? This Kṛṣṇa, He’s enjoying lakṣmī-sahasra-śata-sambhrama-sevyamānam [Bs. 5.29]. Hundreds and thousands of goddess of fortune are engaged in His service. Do you think these lakṣmīs are material women? How Kṛṣṇa can take pleasure in the material women? No. This is mistake. Ānanda-cinmaya-rasa-pratibhāvitābhis tābhir ya eva nija-rūpatayā kalābhiḥ [Bs. 5.37]. In the Brahma-saṁhitā you’ll find that He expands His ānanda-cinmaya-rasa, the mellow of transcendental pleasure potency. And these gopīs are expansion of His pleasure potency. And Rādhārāṇī is the center. Rādhārāṇī is the center. So Rādhārāṇī is not… Don’t take that Rādhārāṇī is an ordinary woman like we have our wife or sister or mother. No. She is the pleasure potency. And the birth of Rādhārāṇī was not from the womb of any human being. She was found by her father in the field. While father was plowing, he saw one little nice child is lying there, and he had no children, so he caught it and presented to the queen, “Oh, here we have got a very nice child.” “How you got?” “Oh, in the field.” Just see. Rādhārāṇī’s janma is like that. So this janma is today and Rādhā, this name is sometimes not found in Bhāgavata. So the atheistic class of men protest this Rādhārāṇī’s name is not in the Śrīmad-Bhāgavatam. How this name came, Rādhārāṇī? But they do not know how to see it. There is anayārādhyate. There are many gopīs, but there is mention that by this particular gopī He is served more pleasingly. Kṛṣṇa accepts this gopī’s service more gladly. Anayārādhyate. Ārādhyate. This ārādhate, this word, ārādhyate means worshiping. From this word ārādhyate, Rādhā has come. But Rādhā’s name are there in other Purāṇas. So this is the origin. So Rādhā, so Rādhā and Kṛṣṇa. Kṛṣṇa is the enjoyer and He wants to enjoy. So He’s the Supreme Brahman. He cannot enjoy anything, ātmarāma, He can enjoy it in Himself. Therefore Rādhārāṇī is the expansion of His pleasure potency. Kṛṣṇa hasn’t got to seek external things for His pleasure. No. He is in Himself full, ātmarāma. So Rādhārāṇī is expansion of Kṛṣṇa. Kṛṣṇa is the energetic, and Rādhārāṇī is the energy. Just like energy and energetic, you cannot separate. Fire and the heat you cannot separate. Wherever there is fire there is heat, and wherever there is heat there is fire. Similarly, wherever there is Kṛṣṇa there is Rādhā. And wherever there is Rādhā there is Kṛṣṇa. They are inseparable. But He is enjoying. So Svarūpa Dāmodara Gosvāmī has described this intricate philosophy of Rādhā and Kṛṣṇa in one verse, very nice verse. Rādhā kṛṣṇa-praṇaya-vikṛtir hlādinī-śaktir asmād ekātmānāv api bhuvi purā deha-bhedaṁ gatau tau [Cc. Ādi 1.5]. So Rādhā and Kṛṣṇa is the one Supreme, but in order to enjoy, They have divided into two. Again Lord Caitanya joined the two into one. Caitanyākhyaṁ prakaṭam adhunā. That one means Kṛṣṇa in the ecstasy of Rādhā. Sometimes Kṛṣṇa is in ecstasy of Rādhā. Sometimes Rādhā is in ecstasy of Kṛṣṇa. This is going on. But the whole thing is Rādhā and Kṛṣṇa means the one, the Supreme. So Rādhā-Kṛṣṇa philosophy is a very great philosophy. It is to be understood in the liberated stage. Rādhā-Kṛṣṇa philosophy is not to be understood in the conditioned stage. But when we worship Rādhā-Kṛṣṇa in our conditional stage, actually we worship Lakṣmī-Nārāyaṇa. You have seen that picture, this viddhi-mārga and rāga-mārga. Rādhā-Kṛṣṇa worship is on the platform of pure love, and Lakṣmī-Nārāyaṇa worship is on the regulative principles. So long we do not develop our pure love, we have to worship on the regulative principles. One has to become a brahmacārī, one has to become a sannyāsī, one has to perform the worship in this way, in the morning he has to rise, he has to offer. So many rules and regulations. There are at least sixty-four rules and regulations. So we shall introduce them gradually as you develop. So in the viddhi-mārga, when you have no love for God or Kṛṣṇa, we have to follow the regulative principles and automatically…, there is practice. When practicing. Just like you practice this mṛdaṅga playing. In the beginning it is not in order, but when you become well versed in the practice, the sound will come so nice. Similarly, when we are engaged by regulative principles in the worship of Rādhā-Kṛṣṇa, that is called viddhi-mārga. And actually when you are on the love platform, then that is called rāga-mārga. So without viddhi-mārga, if anyone wants to learn the rāga-mārga immediately, that is foolishness. That is foolishness. Nobody can pass M.A. examination without going through the regulative principles of primary schools and colleges. So therefore I do not, I mean to say, indulge in the discussions of Rādhā and Kṛṣṇa so easily. Rather go on with the regulative principle at the present moment. Gradually, as you become purified, as you become on the transcendental platform, you’ll understand what is Rādhā-Kṛṣṇa. Don’t try to understand Rādhā-Kṛṣṇa very quickly. It is a very big subject. If we want to understand Rādhā-Kṛṣṇa very quickly, then there will be so many prākṛta-sahajiyās. In India there are prākṛta-sahajiyā. Just like Rādhā-Kṛṣṇa dancing. Rādhā-Kṛṣṇa has become a plaything. The painting Rādhā-Kṛṣṇa, Kṛṣṇa is kissing Rādhā, Rādhā is kissing. These are all nonsense. Rādhā-Kṛṣṇa philosophy has to be understood by the liberated person, not by the conditioned soul. So we shall await for the fortunate moment when we are liberated, then we shall understand rādhā-kṛṣṇa-praṇaya-vikṛtir. Because Kṛṣṇa and Rādhā, They are not on the material field. Try to understand. This is Jīva Gosvāmī’s analysis, that Kṛṣṇa is the Supreme Brahman. The Supreme Brahman cannot accept anything material. So Rādhā is not in the material field. So the lesson is that we should not treat Rādhārāṇī as ordinary girl, or Kṛṣṇa as ordinary man. They are the Supreme Absolute Truth. But in the Absolute Truth, there is the pleasure potency, and that is exhibited in the dealings of Rādhā and Kṛṣṇa. And Rādhā’s expansion all the gopīs, and Kṛṣṇa is the Supreme Lord.